Riesling by Delatite of Mansfield. The fruit gives a wonderful background to the spice with flavours of citrus and refreshing mineral tightness. The seemingly countless, memorable vintages of Delatite have claimed a litany of trophies, accolades and rave reviews throughout the world of wine. Delatite are best known for their pristine and aromatic whites, the quality of their Riesling has shone since the early 1970s. Will develop rich toasty and honeyed flavours as it evolves. Specialising in cool climate wines, especially the aromatics, it is sited on a picturesque rise overlooking the vineyards toward Mt Buller in North-east Victoria. As custodians of the land since the late nineteenth century, the Ritchie family is committed to sustainable agricultural practices and winemaking with integrity. Visit the Delatite cellar door if you are ever in the district, and sample the award-winning wines. Delatite Winery began in the late nineteenth century, when Geoffrey Ritchie left the western part of Victoria to look for greener pastures. He intended traveling to Queensland, but fell in love with the fertile valley of Mansfield in the shadow of the snow-capped mountains, and settled on the banks of the Delatite River. It was Geoffrey's grandson Robert who with his wife Vivienne first planted vines in 1968. 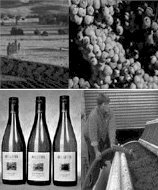 The story goes that Robert was having a drink and a chat with a wine maker from Hardy's at nearby Mt Buller one evening, and a week later 3000 cuttings arrived on the door, somewhat to his astonishment. They planted them on the steep ironstone based slopes surrounding their house and added their care to the rest of the farm work. Ten years, and several hectares, later they were joined in the business by their daughter Ros, one of the first female winemaking graduates of Roseworthy College in South Australia, and the winery was built. The effect Delatite had on the new breed of wineries was immediate. The first vintage won gold at the shows and they quickly rose to become an Australian benchmark for cool-climate white wines, especially in Riesling and Gewurztraminer. Not long after, their second son David came on board to help his father in the vineyard and his mother with the selling. But it wasn't all plain sailing, by a long shot. Sticking to their belief that the wines should be showpieces for their new winegrowing area has often meant tough times, great sacrifices and relentless hard work. Twenty years later and their efforts have paid off. Their successful and productive winery has a reputation both here and abroad for producing some of the finest aromatic whites in Australia, elegant Bordeaux style reds and their critically acclaimed Demelza sparkling wine. In keeping with the family's commitment to the land and their environment, they have recently introduced biodynamic practices in the vineyard. It is still wholly family owned and now Ros and David look forward to generations of successful winemaking. The 2004 Deadman's Hill Gewurztraminer and 2004 VS Riesling also received Bronze Medals in Class 2. Winestate magazine has awarded the 2002 Cabernet sauvignon 4 1/2 stars in its most recent Cabernet Tasting.